By Kendra 4 Comments This content may contain affiliate links. Sophie turned 4 last month and all the sudden I am constantly being hounded with “Mom, I’m Bored!” It’s like she turned 4 and magically thinks that she needs to be doing some sort of project, craft, or activity alllllll the time. So with the “I’m Board” comment becoming a daily occurrence I decided to take some time and think up some ideas to give to Sophie when she says “I’m Board.” Things that don’t involve the TV or the LeapPad. Some of these ideas are pretty basic and non elaborate. But they are still ideas that she can do by herself and don’t involve screen time! 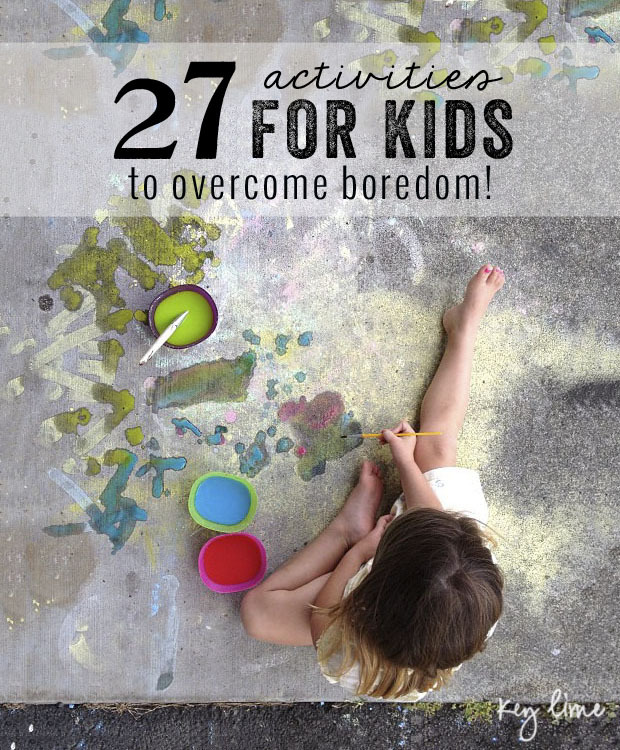 Maybe these can help keep your kids entertained too! 1. Sidewalk chalk painting. Water + Cornstarch + Food Coloring. I don’t really know the exact measurements. It doesn’t need to be exact. But I did notice the more cornstarch the better and brighter it dried. Just make sure you stir it in the cornstarch really well so it doesn’t clump up. 2. Look Through Books. Get a bunch of pillow and blankets out and make a big comfy bed and look through books. 3. Play with board games. Get out a board game or two and play with the pieces. Monopoly is a great one because the houses and money are really fun! 4. Color in Coloring Books. 5. Pull pipe cleaners through a kitchen strainer. 6. Sweep the floor – Okay so the floor probably won’t actually get any cleaner but kids love to copycat what their parents do so naturally cleaning with a broom or vacuum is fun! 7. Take a shoebox or tupperware outside and look for treasures. 8. String beads on a necklace. 9. Play with plastic kitchen cups. Stack them and build a tower. 14. Take a bubble bath. With lots of toys from the kitchen of course! 15. Play outside. Ride a bike, scooter, make mud pies, or look for lady bugs. 16. Letter scavenger hunt. Look for different letters around the house. 18. Play in the hose or sprinkler outside. 19. Draw a picture for grandma. 20. Have an indoor picnic. 21. Play Archeologist. Bury toys in a sandbox and dig them up. 22. Play with balloons. Use the small hand pump and blow them up, let them go, and watch them blow around. 23. Listen to an audio book. From the library or iTunes. 24. Empty a Matchbox (or small container) and fill it with tiny things. 26. Play Zoo. Line up all the stuffed animals and make cages for them with Jenga blocks. 27. 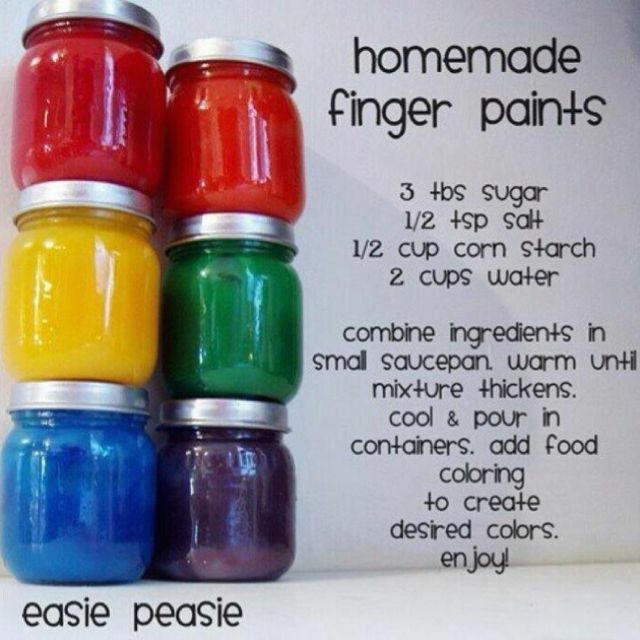 Finger Paint. This is a great one! Well that is a start! As I find more fun crafts and projects I will be pinning them here. Follow Kendra John’s board Kids Activities on Pinterest. Do you have any great ideas that I didn’t mention? Love your ideas. BTW, the correct word is BORED, not BOARD. Great ideas! Featuring on my blog for Family Fun Friday tomorrow.